Oakeater is a Chicago outfit formed in the mid '00s. I must admit I was not familiar with their work before I saw that the band would be releasing their newest album, Aquarius. However, a listen of their cassette, Intrusion, got me interested so I started digging. Apart from a few standalone releases on cassette format, as well as their debut full-length, Molech, Oakeater has collaborated with some true royalty of experimental sound, including Yellow Swans, Mamiffer and Everlovely Lightingheart. 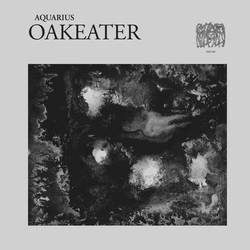 As an ambient outfit, the work of Oakeater steadily travels through different realms of minimalism. The beginning of the opening track sees the band coming in with sparse synths, setting with ease an ominous offering. From that point on the construction of the background is a must, as moments such as the beginning of “Respite” let on. In other instances, the interaction of the minimal background with the main structure of the track is equally impressive, as is revealed in “MAPS.” It is one of these albums that appear to be static and at the same time ever-evolving. The progression that Oakeater follow on their music aids greatly in the construction of this illusion. The rhythmic structure is able to appear in a lucid fashion, adding a certain finality in the opening track or appearing through the haze in “All That Is Sacred.” Oakeater will use percussive synths in order to give more of a unique element to their patterns, while they can also switch the vibe from minimalistic to militaristic, as in the final track, “Respite,” as the different elements are brought together in an intriguing manner, raising the track. The hypnotic tone might be originating from the patterns that the band unfolds, it is however the soundscapes that awaken the ambiance of Aquarius. In “Hatchet,” the band makes use of drone-like effects, with their big sound appearing deep and endless, and brilliantly built around a voice sample, making the process more realistic and palpable. On the other hand, “MAPS” and the title track feature underlying drones, that are able to fill up the space in the background with their all-encompassing characteristic. Especially in the case of “Aquarius,” the atmosphere takes a turn for the more mysterious as the drones are placed between the percussive parts. Apart from the drones, the synths and effects are able to offer a different aspect on the mentality of the band. Where the drones were able to raise imposing soundscapes, the synths can offer a more bitter approach. The alien-like appearance in “MAPS” sets an unsettling dissonance along with the band's persistent motif, while in the title track the lead parts are able to enhance the darkness and inharmonicity, with the parts becoming more abrupt and intense reaching an all-devouring state near the end. The effects on the other hand can be used as to enhance the background of a track, as is the case with “All That Is Sacred,” easily one of the most ritualistic moments of the album as the band masterfully raises dust and haze through the cymbals, granting the song with a mystical vibe. On the other hand, the effects do not have a complimentary role in the title track, but they instead offer a more dissonant edge, resulting in disorienting moments. It is where the extreme identity of Oakeater comes in, because no matter how majestic their ambiance and how ritualistic and mystical the aura of their music, it is the outbreaks in their music that make it take an intolerable form. They arrive quite unexpectedly in “All That Is Sacred” with the extreme, cut-throat vocals raising havoc, creating inharmonicity with their presence amidst the ambient ceremony, soon becoming the centre of anguish for the track. The music is further augmented with the inclusion of various effects and percussive elements, building anticipation and creating a certain instability for the track. In a few occasions, Oakeater do resolve in their cut-throat vocals in order to push the music over the edge, as is the case with “MAPS” and the title track. The biggest and most harsh blow is that the appearance of these instances is an imminent threat, and a hard one to predict given the overall vibe of the album. Aquarius is a cinematic album of towering ambiance. Despite the hiatus that the band underwent, these guys have not lost any of their edge. The opposite, their music appears to be deeper, more matured and holistic, travelling through the darkest of ceremonies and the bleaker of soundscapes. Posted Jan. 18, 2016, 8:22 a.m.